DALE, Ind. 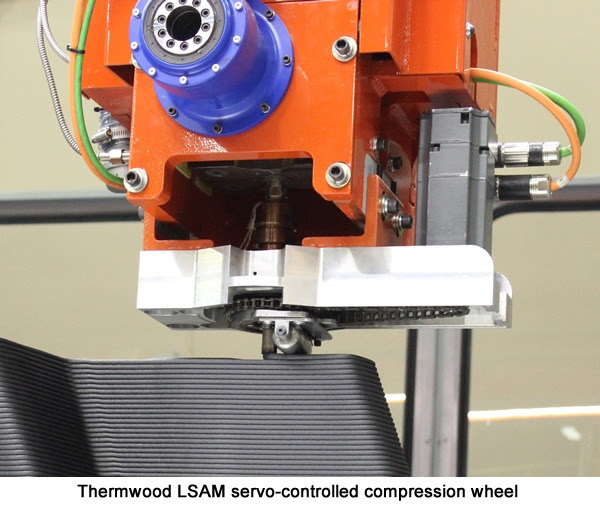 - After recently announcing their line of LSAM (large scale additive manufacturing) machines, Thermwood has now built and tested a high output version of their PH Series composite thermoplastic 3D print head. At a print rate of 500 lbs/Hr, the newest and largest print head, the PH50, is more than three times faster than even the current PH15 print head (which the company believes is currently the highest output composite thermoplastic print head available). 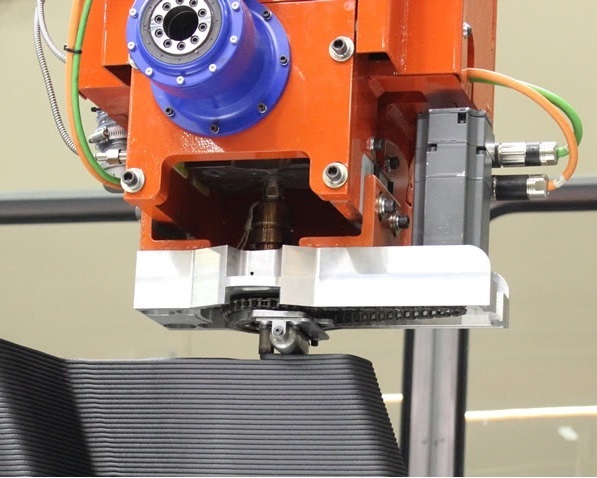 Thermwood has been operating the PH15 print head on the development version of their large scale additive manufacturing machine, called LSAM (L-Sam). The PH15 features a maximum print output rate of 150 Lbs/Hr when running a 20% carbon fiber filled ABS material. The newest and largest print head, the PH50, has been successfully bench-tested at a print rate of slightly over 500 Lbs/Hr running the same material. Fast print rates make possible all new ways to 3D print. The maximum print rate on a particular part is dictated not by the output of the print head, but instead, by cooling. When a layer is printed it must be allowed to cool sufficiently to stiffen enough to support the next layer, but should not be allowed to cool so much that it doesn’t fuse properly with the next layer. This means that, although you may be able to print much faster, with most materials, you must wait at least 1 ½ to 2 minutes before you can print another layer. This would tend to make high output print heads unnecessary except for really large parts, but there are situations where this is not the case. Thermwood LSAM PH50 Print HeadThermwood’s PH Series print head design uses a servo-controlled plastic extruder with a specially designed, patented plasticating screw to heat and soften the composite thermoplastic material. It then uses a servo-controlled fixed displacement polymer pump to deliver the softened material at a precisely controlled rate to the print nozzle. This dual-servo, two-step approach to generating the print bead eliminates a variety of problems encountered when trying to use just an extruder to print and generates a highly controlled material flow rate which results in a highly accurate and controllable print bead size. Thermwood Engineers Testing LSAM PH50 Head at Full OutputCurrently, the new PH50 print head has successfully operated at full output in a static position. Thermwood is replacing its 10x10 foot LSAM development machine with a 10'x20' foot demonstration machine to verify and demonstrate operation of this new head at full print speed. Thermwood believes that 10'x20' is as small a machine as is practical for this high output print head. LSAM machines are available with table lengths of up to 100 foot or more. 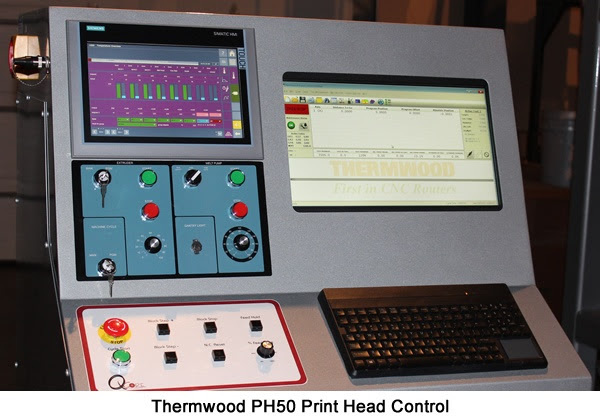 Thermwood is confident that technology in the PH Series print heads could be used in even higher output print heads should a need ever develop. Requests for more information can be filled out here.